In recent years, lots of shops, department stores and markets have been built in Armenia, where anyone can find clothes, souvenirs and other things for any taste and possibilities. Below we present a list of the most famous trading places of the country, which may interest tourists. Dalma Mall is a two-storied shopping and entertainment complex, which is located near the center of Yerevan at Tsitsernakaberd Highway 3. This spacious and prestigious center is suitable for anyone who prefers civilian and comfortable shopping. Due to the ingenious layout, the galleries are well viewed through the shop windows. Escalators and panoramic elevators facilitate the movement of visitors in the center of the complex. In the same building, the customer can find clothes of world famous brands, shoes, accessories, perfumes, technical equipment, and in the gold department one can make a good purchase. Dalma Garden Mall offers the following world-famous clothing brands: Bershka, NewYorker, GAP, Zara, Stradivarius, Aldo, Marks & Spencer, Pull & Bear, Kid’s Clothes and others. For those who want to have a little rest there are cafeterias, pizzerias, as well as cinemas and bowling. Children also will not be bored, because a beautiful playground and a room for mother and children operate here. Shopping and entertainment complex Yerevan Mall opened its doors in February 2014 and quickly became a favorite place for both local people and tourists. The complex is famous for its unique architectural design developed by world-renowned international companies “Broadway Malyan” and “Archangel”. Here you will find a variety of designer shops, as well as a wide variety of entertainment choices. It is here in Yerevan Mall where for the first time were presented such trademarks as F&F, Mac Cosmetics, Zippy, Clics Toys, Mini Raxevski, Richi Art and others. Those who want to buy clothes can choose such brands as Zara, NewYorker, Bershka, Stradivarius, Pull&Bear and others. The complex also hosts a variety of events organized for audiences of all ages. Every week interesting performances with the participation of clowns and cartoon characters are organized for children, and football fans visit Yerevan Mall to enjoy watching the memorable moments on 10 meter digital screen. “Rio Galleria” shop plays a key role in the fashion business of Armenia. It presents collections from the first fashion houses and collaborates with world-renowned fashion designers (Giorgio Armani, Giani Versace, Gianfranco Ferre, John Richmond, Roberto Cavalli et al.). Before its opening, the store was visited by Francesco Dessi, a visual merchandising manager for Rinachsente stores in Milan, who carried out trainings for the staff, teaching them how to serve and help customers to choose the right and suitable clothing. Walking around the store, you will feel as though you are in a small town, where each area differs from the other. The shop offers both casual and evening clothing of such well-known brands as Armani Jeans, Giorgio Armani, Ballin, Valentino Orlandi, Roberto Cavalli, Ralph Lauren and others. As it is common throughout the world, the collection here is updated each season and is brought just in time, before the start of a new season. Qualified consultants meet their clients and help them to travel around such an interesting city like Rio Galleria. Vernissage is a popular Armenian fair, which starts from the underground station “Republic Square” and stretches across Khanjian Street. Every weekend the fair becomes home to hundreds of artists, jewelers, potters and other craftsmen. They present their amazing colorful works that can be bought by anyone who wishes. Here you will find pictures of different artists, Armenian duduk, semi-precious stones, knives, carpets, national jewelry and other works of art and souvenirs. If you want to have a keepsake from Armenia visit Vernissage and you won’t leave it empty-handed! Yerevan, Metro “Republic Square”, Hanrapetutyan str. Another popular among tourists place is “Treasures of Nina” shop, which presents Armenian souvenirs, handmade clothing and bags, and accessories for interior design, all of which is manufactured by “Nina Hovnanyan Couture” company. Products of this company are made in Armenia and exported to the United States, Russia, the United Arab Emirates, Australia, Germany, France and other countries with the label «Made in Armenia». According to the head of the company, Nina Hovnanian, the store is of a great interest for tourists, and the international press is just in love with their production. If you want to buy a real handmade carpet, you can visit “Megerian Carpet” shop, which is located in the center of Yerevan on Abovyan Street. This company has restored the Armenian tradition of handcrafted carpets. 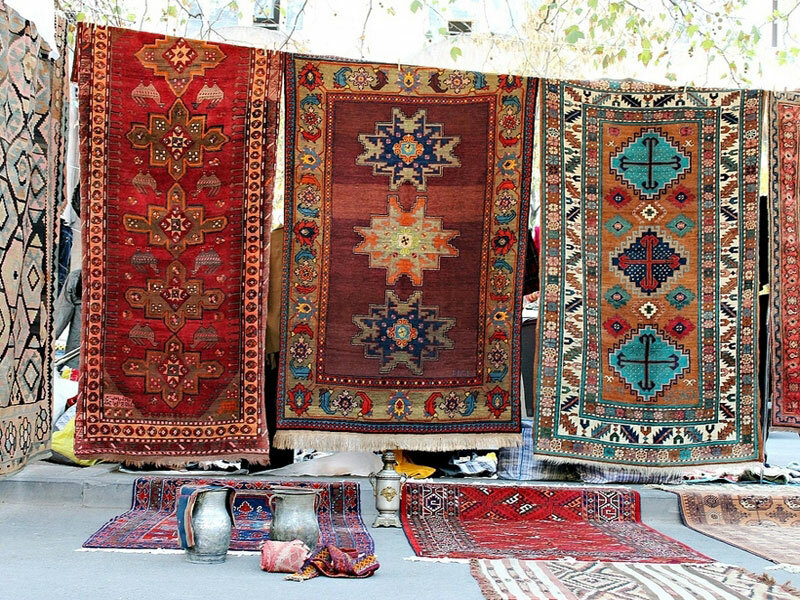 Due to its activities, Armenian carpets have appeared in the world market and world exhibitions. Here you will find carpets with both traditional and contemporary designs. The company can also arrange a tour to the carpet factory, where you can get acquainted with carpet manufacturing, see the exhibition hall and buy a real handmade carpet. Manufactory: Yerevan, Madoyan Str., 9, Tel. + 374-10-448661, + 374-55-990995 (mobile). Yerevan cognac factory “Ararat” is one of the most popular in the country. Its products are known not only in Armenia, but also around the world. Four years in a row, the brand “Ararat” was honored the nomination “Product of the Year” in Russia. This factory is located at Tsovakal Isakovi ave. 2. Anyone can have a tour around the factory and learn about the history of the brand, as well as taste or byu cognac. On Dzhanibekyan Street another famous cognac shop “Pernod Ricard Armenia” is located. Here you will find a range of both global and well-known Armenian beverages, among which the most popular is the “Ararat”. It is impossible to visit Armenia and not to try Armenian national products. For this purpose, we advise you to visit the central market “GUM”, which is located at the intersection of Mashtots and Khorenatsi streets. Here you will find different products of Armenian cuisine, oriental sweets and a variety of other delicacies: halva, rahat-lukum, chuchhela, honey, and traditional pastries. And, of course, it is impossible to imagine Armenian market without fresh fruits and vegetables, herbs and spices, nuts and dried fruits. Once you are there, you will experience a real Armenian coloring and make a purchase at very competitive prices. Having chosen our Wine Tour to Armenia, you will visit the food markets, as well as the cognac factory ArArAt, where you will be able to buy famous Armenian cognac.